Kids learn the parts of a book, how to hold a book, and how to turn the pages. 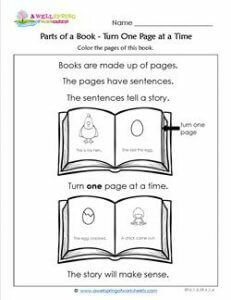 This worksheet shows what happens when you turn one page at a time. The story makes sense like it’s supposed to! It’s one of the simple rules of reading that we take for granted that kids automatically know.